“Out of many, one,” which in Latin is emblazoned over the eagle on the seal of the United States, is especially tough to parse during election season, when we slice and dice the electorate, and pit red state against blue. It’s at the core of conceptual artist Allan McCollum’s “The Shapes Project,” a clever and challenging subset of which, “Perfect Couples,” is on view at Barbara Krakow Gallery. McCollum has for years thumbed his nose at the art market’s tendency to value unique works over multiples by creating huge numbers of related individual objects. For “The Shapes Project,” which he’s been working on since 2005, he has set out to design a single shape for every person on the planet — these days, that tops out over 7 billion. Anticipating population growth, he has created a system that has the potential to produce up to 31 billion unique shapes, outfitted with a variety of swellings, corners, and cockscombs. An image from Evelyn Rydz’s “Driftline’’ series, at Ellen Miller Gallery. Shapes, of course, are not ideological, emotional, or afraid. It’s easy to conceive of them as one large group, which seems to be McCollum’s point — if we weren’t so prone to taking sides in order to define ourselves, we might be able to think differently about the human race and its prospects. 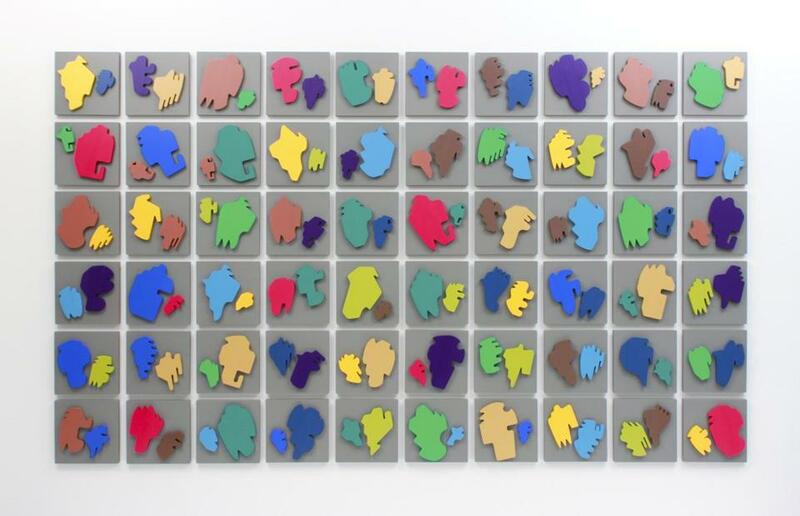 “Perfect Couples” comprises grids of his paired, painted wooden forms, arrayed according to color value. There’s a pastel grid, a dark one, a bright one, and more. Arranging them this way inevitably triggers comparisons. The pastel ones seem friendly; the bright ones shine like extroverts, commanding attention. The dark ones are moody and deep. Look more closely, and each couple displays its own tension. How will that small, green, rounded cross stand up to the much bigger mauve shape that evokes a cartoon of a big-nosed guy with a comb-over, with which it shares a panel? Even as McCollum summons the idea of every person on equal footing, he demonstrates how easily we default to “us versus them” stories. Suppose McCollum could distribute his shapes to everyone, worldwide, and each form became a personal avatar. Would people build alliances according to the likeness of their shapes? It’s what we do. It would be hard to break us of it. Evelyn Rydz has traveled up and down the coasts of North and South America, photographing the detritus that washes up on the beaches. From the photos, she makes intricately detailed colored-pencil renderings on silky smooth architectural drafting film. The sharp drawings seem to glide atop the surface of the film. For much of her show at Ellen Miller Gallery, Rydz leaves landscape behind, and it’s a dramatic leap. 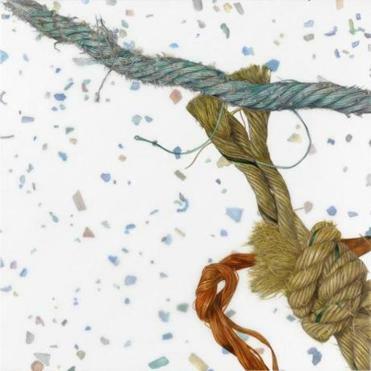 The two landscapes on view, from the “Gulf Pile” series, are dense, vibrant still lifes, but in the “Driftline” series and the remarkable large-scale drawing, “1000 Years” Rydz focuses on one form of flotsam — the frayed rope. For “Driftline,” the artist placed recovered fragments of rope in a kiddie pool, created a current, and videotaped their movement. The drawings capture moments from that recording. The ropes, portrayed up close and with acuity, whirl and fly over one sheet of translucent film. On a second sheet beneath, Rydz has depicted green, blue, and red bits of sea glass and plastic, scattering everywhere like confetti. There’s a sense of tethers letting loose, of flight, of celebration. With no horizon line to anchor the scene, Rydz pulls the hyper-reality of her drawing style into an abstract realm, where the muscular gestures have as much pull as the ropes’ careful depiction. “Gyre Memory,” the three-channel video of the action in the pool, has the same effect, grabbing the eye as bright cords loop through the dark. The biggest work, “1000 Years,” also leans into abstraction. Here, Rydz depicts the so-called Global Conveyor Belt, a worldwide system of ocean currents, mapping it out with depictions of rope. The whole loops across three scrolls of film, each length of rope frayed and mingling with the next. There’s much to see in it: a circuit, a line, a tracing of trash, a pathway. Freed of the context of the beach, these drawings offer more to the imagination than a landscape does. “American Family’’ is part of Richard Cutrona’s “Political Lens’’ exhibit. A lenticular print, like the kind once found in Cracker Jack boxes, shifts from one image to another as you pass by. Richard Cutrona uses the medium to delve into American identity, history, and foreign and domestic policy in his show at HallSpace. Some of these, such as “War (as told to me by cable TV),” are visually captivating. 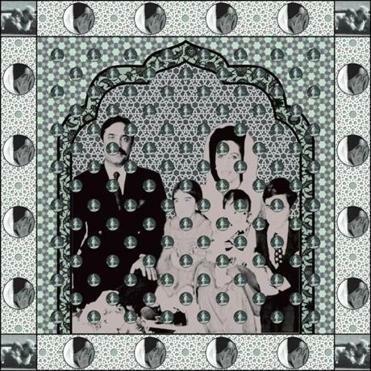 This one is fashioned to resemble designs in Middle Eastern art, but with figures winking in and out: Saddam Hussein becomes Ho Chi Minh; Benazir Bhutto becomes John F. Kennedy. George W. Bush is all over the piece. Using iconic images overloaded with meaning, Cutrona perhaps inadvertently comments more on how media shapes and polishes the story than on the story itself. There’s a ricochet quality to the way the images play off one another, and the effect can be cacophonous. These works are fun, but they only sporadically deepen the conversation. Correction: Because of a reporting error, an earlier version of this story mischaracterized artist Allan McCollum’s creative process for “The Shapes Project: Perfect Couples.” McCollum created the work using a common computer drawing program.